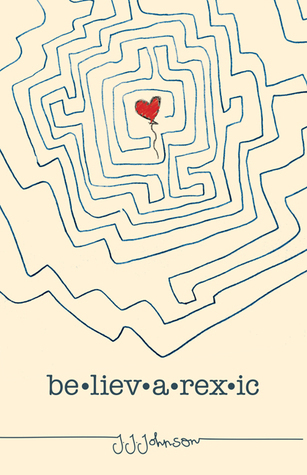 I received the ARC for Believarexic by J.J. Johnson from NetGalley in exchange for my honest review. The scheduled publication date is October 1, 2015. This was such a powerful book. Part memoir and part novel, this is the story of the author's time spent in an eating disorder treatment facility in 1988. Jennifer knows she has a problem. She starves herself and also makes herself throw up. The first few chapters are told in journal format and is told in verse. 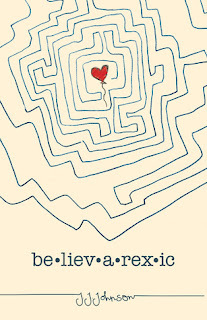 It is powerful stuff when she compares her eating disorder to a monster. It's actually interesting that the beginning of the book is told in third person format, but then she gradually switches to first person as she spends more time in the treatment facility. She tells her parents she has a problem, but they don't believe her. They think she is making it up to get attention. Jennifer's pain and anxiety are so easily felt. And when she checks into the hospital, she meets a wide variety of doctors and nurses and patients, some helpful in her recovery and some not. When she enters the treatment facility, she immediately wonders if she even wants to get better and she wonders if she did the right thing. The nurses don't trust her and she feels like she is in prison. There were several times where she assumed she would be treated differently because she voluntarily checked herself in. It is evident very early that Jennifer suffers from more than just an eating disorder; she also drinks way too much and she suffers from depression. I could relate to Jennifer in so many ways. I have struggled with disordered eating in the past and I always told myself it wasn't as bad as it could be, just like Jennifer. Jennifer knew she needed help, but she also couldn't help comparing herself and her health to other people. Her parents did that as well. They thought that because she was functioning and getting straight A's, she must not be sick. But most people will tell you that perfectionism is a major personality trait in people with eating disorders. The actual treatment plans and journal entries that Jennifer inserted from her stay added a realistic overtone to the novel. I do believe that the fiction part of the novel comes through in some of the characters and some of the timelines. I loved Jennifer's therapist, Dr. Prakesh and her secondary nurse, Chuck. I also thought it was a nice touch that the author didn't mention any weight numbers throughout the book. I know the author did this so that people with disordered eating would not be triggered by these numbers. I have to be honest and say that I probably would have been triggered myself by the numbers. One problem I did have was with Jennifer's primary nurse, Sheryl. The patients called her Nurse Ratched behind her back. Now I am not sure if the Nurse Ratched character was fictionalized or just exaggerated, but some of her actions seemed so incredibly unrealistic to me. I know that you can't really trust the patients in the eating disorder clinic (at first), but she was so extreme about EVERYTHING. She made one girl eat more than what her calorie requirement said she had to; she yelled at them for playing cards after dinner and said they were avoiding their feelings; she yelled at two of the girls for dancing and singing to a song and said they weren't supposed to be exercising. It was just one thing after another and it seemed like some of the doctors and nurses knew what was going on with her. Some of her behavior did make sense towards the end of the book, but I felt like the staff should have stepped in way earlier and should have done something about her. Another issue I had was that the pacing kind of off at the end. I felt like the ending got wrapped up a little too fast. Buy/Borrow/Skip: Buy this one. I do think it is worth reading. Not sure this is one for me but it does sound interesting and also a good book for highlighting how complex eating disorders are.